We know that parent engagement makes a difference. Students whose family members are involved in their education, regardless of their background or income, have better attendance, higher grades, and more rigorous course schedules. But what if a language barrier keeps schools from fully connecting with parents and families? English Language Learners are the fastest growing segment of the student population — in 2014, 11.8 million students spoke a language other than English at home. It’s imperative for schools and teachers to collaborate in support of students and families across languages. Not only that, but embracing and encouraging multiple languages and cultures (in the classroom) can be an educational asset. In order to get there, teachers must be willing to engage. I spoke with my friend and former colleague, Christian Martínez-Canchola, about the best strategies teachers can employ to connect across language barriers. Christian currently serves as the Primary Years Programme Dean at Uplift Grand Preparatory in Dallas, Texas. 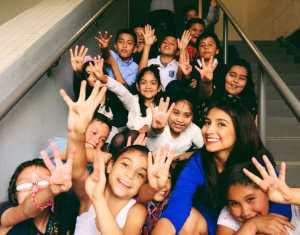 As a classroom teacher, Christian led her bilingual students to outstanding outcomes — they consistently outperformed district averages by 30-point margins on district, state, and national assessments. Empower teachers with existing resources: Districts and school leaders can connect their teaching staff with free and low-cost tools to make translation easier. Many large districts, including District of Columbia Public Schools, New York City Department of Education, and Dallas Independent School District, have translation hotlines, where teachers can reach interpreters and teams dedicated to translating documents. In addition, the Google Translate app has text translation for over 100 languages, and can translate bilingual conversations for 32 others. While not a true replacement for face-to-face translation, these tools can serve as a point of entry. Christian’s work is fueled by a fervent desire to exemplify the strength and power of her students and their families. As one of the few Latinx and bilingual school leaders in her network, Christian says she is passionate about building a pipeline of educators who both reflect the communities that they serve and driving transformational, sustainable change. We can borrow lessons from her work empowering teachers to connect across lines of differences in the pursuit of positive outcomes for all children. This entry was posted in Education Policy, Equity, Politics of Education, School Leadership and tagged Diversity, English Language Learners, equity, family engagement, parent engagement, parent involvement, Professional Development, Teacher Preparation on September 19, 2017 by Kirsten Schmitz. Thank you, Christian, for the great work you’re doing, empowering parents! I work with those parents in our library’s Adult Learning Center, and YES! one of their top priorities is helping their children with their homework!